I participated in a Influencer Activation for Guy Fieri Sausage. I received product samples to facilitate my review as well as a promotional item to thank me for my participation, however, all opinions are my own. I've always been a pasta lover, but lately it seems like we've been eating it more than usual. I've been trying new things, and not using red sauce all the time. Now my youngest son is huge fan of red sauce, so getting him to eat pasta the non-traditional way has been a challenge, but lucky for me the dishes I've made he has liked! I was recently sent some of Guy Fieri's new smoked sausages to try out, and was more than excited to come up with a new recipe using them! 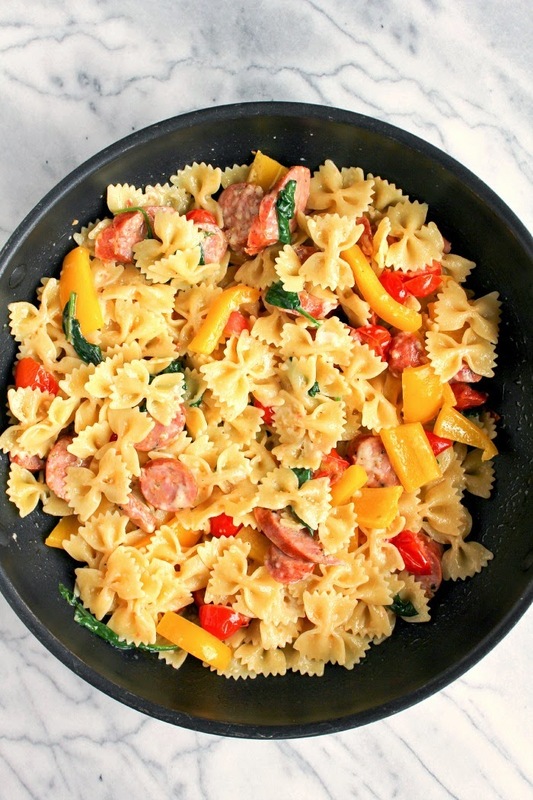 I love using sausage with pasta, so this was another chance for me to come up with an amazing pasta recipe. The two sausage varieties I received were the Italian and the Mozzarella and Parmesan Cheese. Both right up my alley! For my dish I decided to go with the Mozzarella and Parmesan Cheese Sausage, because everyone loves cheese and pasta. Amiright? The kids and I did try the Italian Sausages as well and they were just as delicious! Since the weather is finally starting to get nice here in Michigan, I was thrilled to throw my sausages on the grill. They are already fully cooked, so you just need to warm them through and get pretty grill marks on them. I chose to make this dish with some Spring vegetables since, well, Spring is finally here! 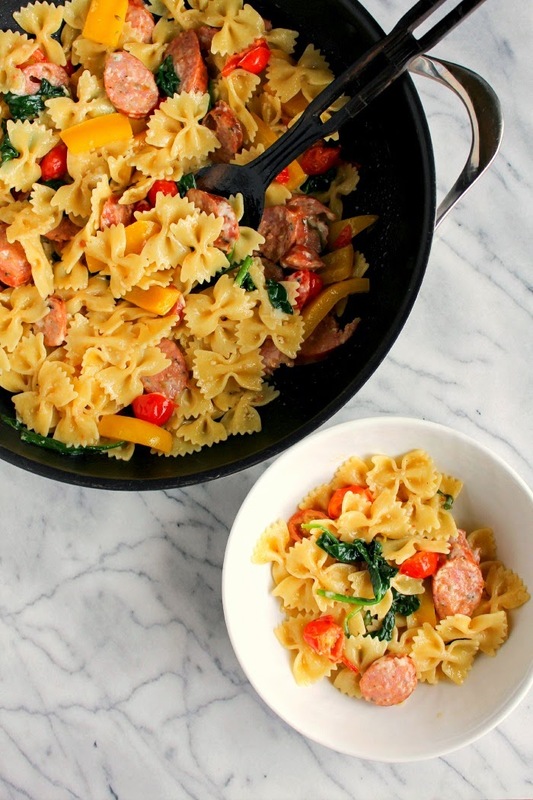 Grape tomatoes, sweet bell pepper and spinach go perfectly with the sausage, but you can feel free to substitute any other of your favorite veggies. Mushrooms would be great in this, too. 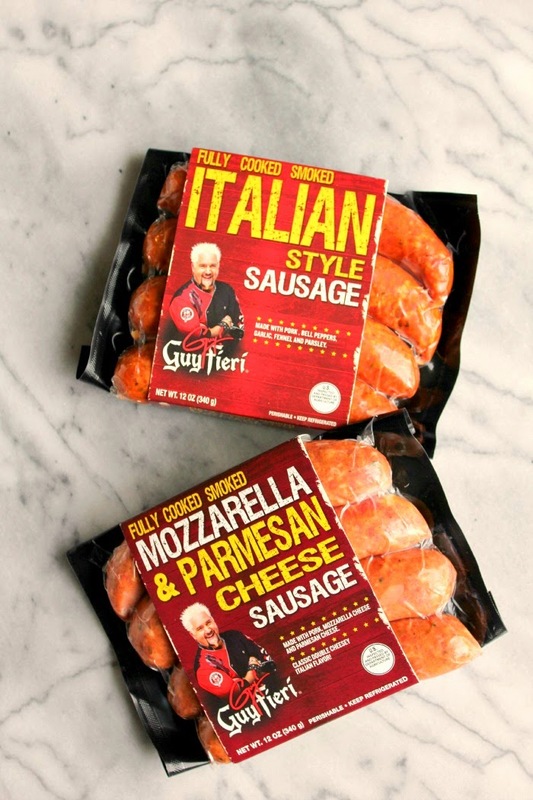 Guy Fieri Sausage Links are full of fresh ingredients and come in both chicken and pork varieties. Available exclusively at Walmart, each package contains 4 links. 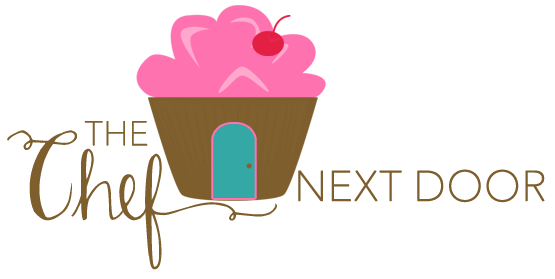 Check out all the different flavors on Guy's website, or visit him on Facebook and Twitter. Cook the pasta according to package instructions, draining it about 2 minutes sooner than directed. Reserve about half of a cup of the cooking water. Grill the sausages either on an outdoor grill or a grill pan on the stove over medium-high heat until they have grill marks and are warmed through. Set aside until cool enough to handle, then slice the sausage into rounds. In a large, deep skillet, heat the butter and olive oil over medium heat. Add the bell pepper and grape tomatoes and sprinkle with salt and pepper. Cook until softened, about 10 minutes. Add in the spinach and let it cook 2-3 minutes. 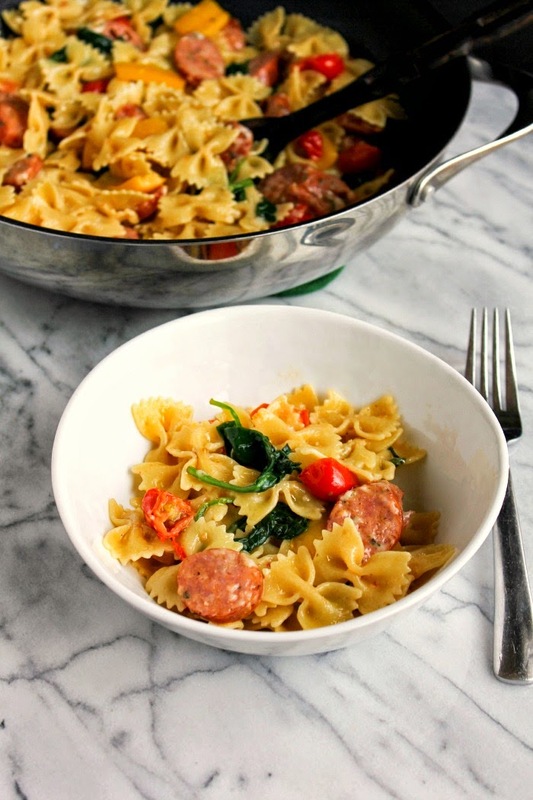 Turn the heat to medium-low and add the cooked pasta and sliced sausage. Stir gently to combine and cook for a few minutes until everything is warmed through. Sprinkle with the Parmesan cheese and add a bit of the pasta water to make a sauce. Test for seasoning and add more salt and pepper and pasta water, if needed.